By Louis Jacobson on Thursday, October 4th, 2018 at 5:03 p.m. In his historic testimony before the Senate Judiciary Committee, Supreme Court nominee Brett Kavanaugh defiantly accused Democrats and the Clintons of orchestrating a political "hit" to keep Kavanaugh off the country’s highest court. The statement was controversial enough. But some heard Kavanaugh go even further, saying that if confirmed to bench, "what goes around comes around." "Perhaps the most chilling line in Kavanaugh's speech was, 'what goes around, comes around.' He did not say it with any evident sadness, nor did he renounce it as a value," Jonathan Chait wrote in New York magazine. "Here was a man apparently threatening revenge on his political enemies, and asking for a lifetime appointment with supreme power of judicial review with which to do it." " 'What goes around comes around' sounds like a threat," said USA Today columnist and CNN contributor Kirsten Powers. U.S. Sen. Chris Murphy, D-Conn., took to Twitter to vent on the day that the FBI gave senators the results of its supplemental investigation into allegations of sexual assault against Kavanaugh. "After I spend my 5 min today with the single copy of the FBI report I will be thinking of how Kavanaugh calls Democrats 'embarrassments', thinks we are engaged in conspiracy against him on behalf of the Clintons, and promises when he’s on the Court 'what goes around comes around'." After I spend my 5 min today with the single copy of the FBI report I will be thinking of how Kavanaugh calls Democrats “embarrassments”, thinks we are engaged in conspiracy against him on behalf of the Clintons, and promises when he’s on the Court “what goes around come around”. There's enough discussion about Kavanaugh's comments that we think it's important to show his words in context, so you can interpret whether he was threatening Democrats or making some other point. Here's the relevant passage from Kavanaugh’s testimony on Sept. 27, in which he blasted his critics as partisans trying to keep him off the court through what he termed a last-minute smear. "This whole two-week effort has been a calculated and orchestrated political hit, fueled with apparent pent-up anger about President Trump and the 2016 election. Fear that has been unfairly stoked about my judicial record. Revenge on behalf of the Clintons. And millions of dollars in money from outside left-wing opposition groups. "Last time I was here, I told this committee that a federal judge must be independent, not swayed by public or political pressure. I said I was such a judge. And I am." 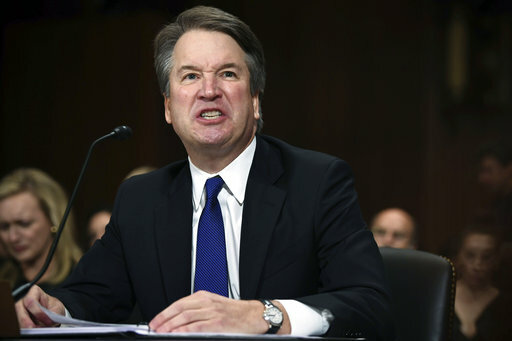 Says that Brett Kavanaugh "promises when he’s on the Court 'what goes around comes around.'"